Jewelry and accessories service is very popular. it mainly locates in a shopping mall or jewelry store, did you plan to start your jewelry business ? 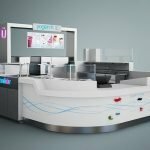 are you still search unique kiosk on the website? stop doing that. 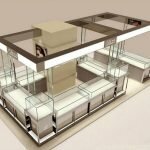 today I’m going to share a nice and cool jewelry kiosk design. > Color: white or customized. > Material: MDF, Tempered glass. > Accessories: acrylic logo, lightbox. > Design: 3d max and CAD drawings. Let’s see this kiosk together, the whole kiosk main tone is white, it’s very simple and exquisite. 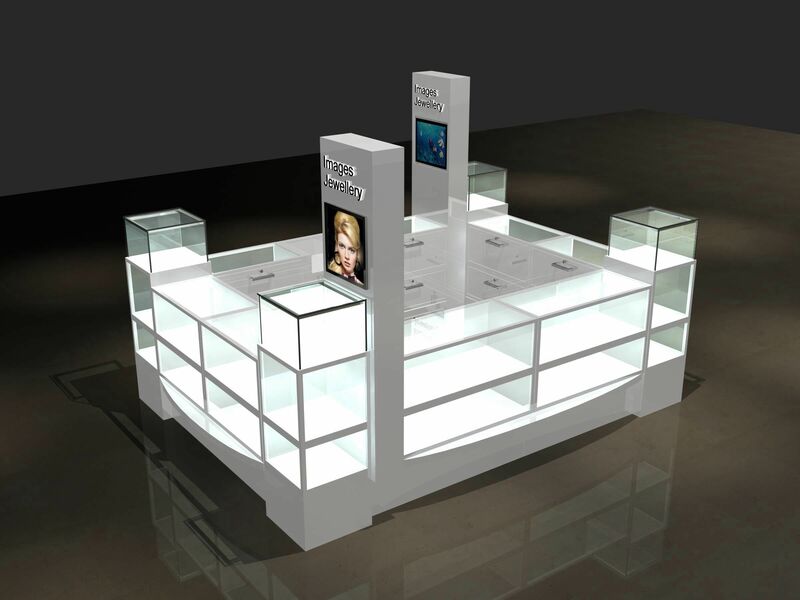 whole kiosk four sides with wood display shelves, each shelf hidden led light strip. there has four high display stand on the corner. two signs for put logo and lightbox. the bottom of this kiosk with many drawers for storage. How can I make a jewelry kiosk like this one? 1. Get a lease in the mall. confirmed your kiosk size. usually is 3m by3m, but it can be customized based on your locate measure. 2. Confirmed the kiosk color, make it match your logo and the mall tone. 3. Make a design for the whole kiosk, can do it modern, luxury, exquisite. try to make the whole kiosk special and attractive. 4. 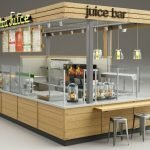 Find a direct supplier help you build it, a high-quality kiosk can help you save cost. Thanks for your time and reading, hope this article can give you some suggestions. 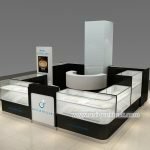 more information or other unique jewelry kiosk design, pls feel free to contact us as below, thank you!